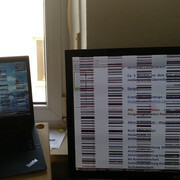 while running i had problems with the display (see screenshot). So i resetet it. Unfortunatetly then it was broken and only the keyboard flickered. After googeling a while, i deconnected my battery. Then it booted. BIOS want a new date (BIOS and OS selection looks fine). However when booted, the display error comes back. Also when booting from a live USB stick. Now, i cannot get it to boot anymore. Is there anything to repair? where can i get spare parts? Last edited by KUGA on Mon May 14, 2018 10:43 am, edited 1 time in total. IIRC the X1 Carbon 2014 uses the built-in Intel Graphics. Does the issue persist even when using an external monitor? If yes, it boils down to either bad RAM, or a CPU problem. Then, to avoid driver issues (the randomly occured in my linux mint) i used only the internal screen.